(TibetanReview.net, Jan26, 2018) – The Vatican is said to have asked a Chinese bishop recognized by it to step down in favour of someone whom it had excommunicated but is approved by the Chinese Communist Party, reported the Cantonese Service of Radio Free Asia (Washington) Jan 24. The Catholic Church has for long been seeking to reach a deal with China on this and related issues. An envoy from the Vatican asked Bishop Peter Zhuang of Shantou in the southern province of Guangdong to retire in favour of the government approved bishop, Catholic news site AsiaNews was cited as reporting. Bishop Zhuang was secretly consecrated with Vatican approval in 2006. The news site has noted that Zhuang is currently only recognized as a Catholic priest by the Chinese government. And the Vatican has now asked him to stand aside in favour of Bishop Huang Bingzhang, a long-standing member of China’s rubber-stamp parliament, the National People’s Congress (NPC), and who has previously been excommunicated by Rome. Zhuang, 88, was said to have been under police surveillance since Dec 11 and had been taken to Beijing from Dec 18 to 22 to meet with central government religious affairs officials and a delegation from the Vatican. He was taken to the headquarters of the Communist Party-backed Chinese Catholic Patriotic Association, where he met with several state-appointed bishops at a government-backed bishops’ conference. Also, a second Vatican-appointed bishop has asked to downgrade himself to act as “assistant” to a government-approved bishop, the site was cited as saying. The Vatican insists that only it can appoint Bishops. China, on the other hand, does not accept its authority. This has split the catholic believers in China between those who accept the authority of Beijing through its Chinese Catholic Patriotic Association (CCPA) and others who only accept the Pope’s supremacy and who worship in underground churches. China has recently ordained more and more of its own bishops without Vatican approval to meet the needs of a growing Catholic population. 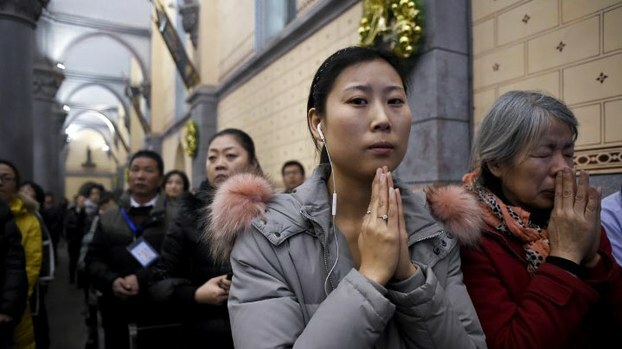 And the Vatican typically responded by excommunicating bishops who accept Beijing’s consecration ceremonies. The Vatican currently maintains formal diplomatic links with the 1911-founded Republic of China government on Taiwan. Beijing and the Vatican resumed official contact in 2014 in a move to reach a deal on the Bishop appointments issue. However, China’s main objective is apparently to get the Vatican to switch its diplomatic recognition from Taipei to Beijing. The Vatican delegation was also stated to have traveled to the southeastern province of Fujian to meet with Bishop Vincent Zhan, one of the seven Communist Party-backed bishops awaiting recognition from Rome. And it has asked Vatican-recognized Bishop Joseph Guo to consider demotion to act as assistant to Bishop Zhan. At present, half of China’s 97 Catholic dioceses are said to be without a bishop. Anthony Lam, of the Holy Spirit Study Center in Hong Kong, has said the administration of President Xi Jinping, which regards religion as a dangerous foreign import in a country ruled by the atheist Communist Party, had made scant progress in consecrating more Catholic bishops under the CCPA. Atheist China has an army of officials whose job is to watch over faith-based activities, which have spread rapidly in recent years with the country’s economic growth. Party officials are put in charge of Catholics, Buddhists, Taoists, Muslims, and Protestants. Judaism isn’t recognized, and worship in non-recognized temples, churches, or mosques is against the law.